Spring has sprung and Summer is nearly here. Let’s celebrate these sunnier days with a more color. 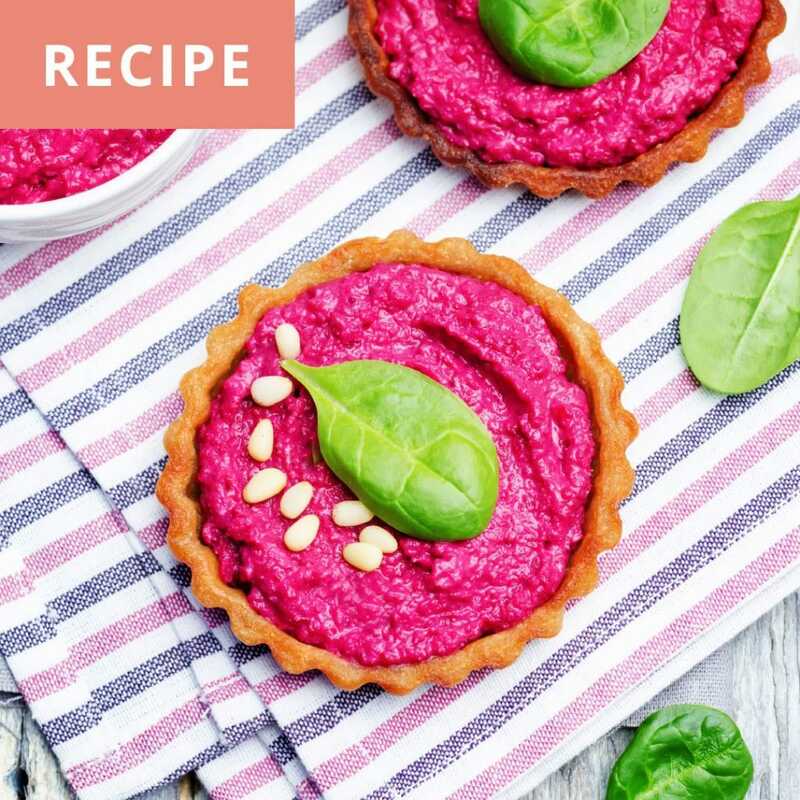 Today’s recipe, BEETROOT HUMMUS TARTLET, calls for fresh beets, pastry dough and a food processor (or blender) and a mixed green salad. Aside from their gorgeously vibrant color, Beets are high in Calcium, Iron, Vitamin A, Vitamin C, Fiber, Potassium and Manganese which are good for not only boosting your immune system but are essential to healthy nerve and muscle function. 3. The advantage of this recipe is that you don’t have to put it a few hours in the fridge, you can work it right away. 4. Place pastry dough on a flat floured surface and start rolling from the center out, lifting and turning pastry occasionally to keep it from sticking. If the pastry begins to stick, rub more flour, a little at a time, on the flat surface and rolling pin. 6. The best is to place those molds in the freezer for 15 minutes before cooking them, it will allow the edges not to fall. 7. Cook the pastry shells for 15 minutes at 380 or until golden brown, watch it can quickly turn from brown to burnt! This can be done the day before and they can be kept in a closed container. 1. Combine all ingredients into a food processor or blender (except the olive oil), blend until smooth. Drizzle in the olive oil as the hummus is blending or mixing. 2. Adjust seasonings to taste, add more salt, lemon juice to brighten, or water to thin/adjust the thickness of the hummus. Pour some hummus in the cooked pastry shells and serve with a baby mixed green salad, it is divine! It can be an appetizer or a light dinner. Kids love it as well! Also try my BEET HUMMUS.